On January 18, 2012, Warren and Mary Perrin met with Lawrence N. Powell, Ph.D., who recently retired as a history professor emeritus from Tulane University. Powell is a decades-long resident and keen observer of the city of New Orleans. While at Tulane, he held the James H. Clark endowed chair in American civilization. In 2012, Powell's book, The Accidental City--improvising New Orleans (Harvard University Press, Cambridge, Massachusetts, 2012) was released to critical acclaim. The book masterly chronicles and underscores the fluidity and contingency of the past, revealing a place where people made their own history. During the Perrins' encounter with Powell during the mid-year meeting of the Louisiana Bar Association in New Orleans, they discussed a collaboration for an upcoming project with the Francophone section of the Louisiana Bar Association whereby Powell will submit a paper and deliver a talk on the historical significance of the Louisiana constitution and Supreme Court. On March 1, 2013, the Louisiana Supreme Court will host a reception commemorating the bicentennial of the court. Perrin serves as the Chairman of the Francophone Section of the Louisiana Bar Association. In 2003, he authored the book Acadian Redemption, the first biography of an Acadian, Joseph Beausoleil Broussard. The book was honored by the Louisiana Press Women Association as the Best History Book published in Louisiana that year. 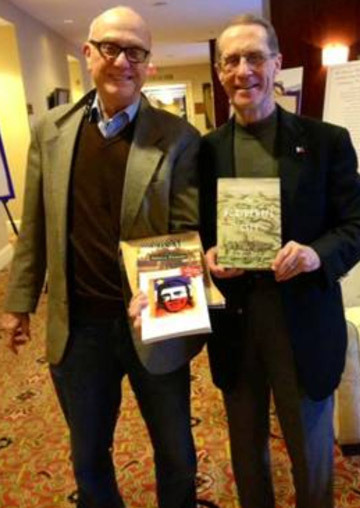 Shown below are Lawrence N. Powell, Ph.D. (left) and Warren A. Perrin, J.D., exchanging the books that they wrote.